See us if you need a new wire! The BOA closure system found on snowboard boots, our Tubbs snowshoes, boots, golf shoes, running shoes and a whole lot more is a tough, clever way to get tightly into your footwear. The wires can break (apparently the twist unit can get bashed to death by some of you mad tree bouncers)—although it doesn't happen that often. If it does, just come by Dancing Snow. We've been trained, we have the parts (which are free), and we can get you back in pristine form and ready to head back out on the hill. The labor will be affordable, too—just buy a beer and relax while we rethread the wires! 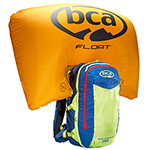 (or a coffee, or a new BCA avalanche transceiver. We aren't fussy). Let us know if we can help! Dancing Snow provides sales and rental of beacons, airbags and air cylinders from BCA, the premier manufacturer of snow safety goods. The air cylinders for Japan are different from those for Europe and North America, meaning they can't be filled in the country—so just rent a cylinder, or a complete Float airbag system, for your stay in Myoko. Let us know well ahead on the airbags, though, so we can be sure and have one ready for you. The latest from our snow study plot and findings on the hill. Things were getting long here, so find reports both new and old on our Facebook page. We're always looking to hear from you about what you find out on the hill! The more information we have and can share here, the better, more accurate and more informative it will be! Be sure to check out our Facebook page. We’re in the mountains, but we love to go out on the water. Myoko’s a great place for sea kayaking: Lake Nojiri is just minutes away, and is ideal for a first, wave-free kayak experience. And within an hour, we can be on the ocean in an area that’s fun for beginners or experienced kayakers alike. We also have a great deal of experience in hosting multi-day sea kayak touring on the Sea of Japan. Destinations include Wakasa Bay in Fukui, the Noto Peninsula in Ishikawa, Awashima Island off the northern coast of Niigata (a great first camp/kayak destination) and Sado Island, right off the coast here. For tours, we often work with our partner Granstream. We would be very happy to develop an itinerary and estimate for you, based on the number of people, days and destinations. 1. Depending on weather and snow conditions, tour destinations may be changed, or the tour cancelled. 3. Every Dancing Snow client is automatically included in our group insurance policy at no additional charge (please contact us if you would like more details on coverage). We also strongly suggest that all those taking part in backcountry tours have their own active insurance policy which covers outdoor activities. 4. If you do have a chronic health condition, we appreciate your letting us know. We know that many people can take part in outdoor activities despite some conditions, and we respect your ability to judge if a tour will be within your abilities. Your information will be kept strictly secret, but will be very useful in helping us respond should anything happen during the day. To ensure the safety of our guests, we do ask for personal information including telephone numbers, emergency contacts, etc., as part of registration for lessons and tours. We will not use this information for anything other than this purpose, nor will we release any personal information to any third parties. © Dancing Snow. All rights reserved.